At the end of November the makers of Magners cider, C&C bought the UK cider brands Blackthorn, Olde English and Gaymers as part of a £45m deal. Irish cidermakers Magners have got very good at making cider popular, its this industrial cider that has actually bought attention to traditional ‘artisan’ cider which isn’t bad. However, cider fans and producers are worrying as they’ve just bought one of Somerset’s crown jewels, Gaymers of Shepton Mallet. “This transaction strengthens our position within the world’s largest cider market and broadens the scope of the group’s existing cider offering,” he added. C&C Group has more than doubled its UK cider volumes. 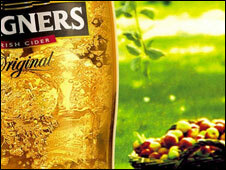 Magners cider goes head-to-head with Heineken’s Bulmers in the UK. 250 staff will transfer, and I’m told there is no threat to their jobs. In Ireland they’re not called Magners, but Bulmers. Why? Because many years ago, the Herefordshire cider dynasty that is Bulmers set up an Irish offshoot. As happens, it split off after a while and went native. And now the Irish cousins are back here, teaching Somerset cider men how to sell their brew! There are a few unanswered questions, such as will the cider remain the same under new management? and is being bought out the way for struggling cider producers to stay afloat as cider tax duties increase to perhaps the same as beer prices?